With the success in the early 1980s of Kenny Roberts and the Yamaha YZR500 in Grand Prix motorcycle racing Yamaha realised that a road going replica of their 500 cc racing machine would sell well. Using the similar technology of the smaller RD series of two stroke motorcycles the RD500LC was launched in 1984 to an enthusiastic riding public. The RD500LC uses a 50-degree, twin-crankshaft V4 engine layout. Linked Yamaha YPVS exhaust power valves are controlled by a single electronic unit and servo motor and are designed to give a broader power band. The engine also featured intake reed valves unlike the YZR500 racer which used rotary disc valve induction. The reed valves used two different intake arrangements, the lower cylinders were fed through crankcase mounted reeds; the upper pair used cylinder barrel mounted reeds. The carburettors are side mounted in pairs and feed each cylinder through 90 degree intake manifold. The lower expansion chambers exit normally but the upper pipes cross over each other just behind the exhaust ports to maintain the correct tuned length. The dual crankshafts are geared directly to the clutch, while the front crankshaft also drives a counter balancer shaft mounted between the two crankshafts. The counter balance shaft, unusual on a two-stroke, assists with dampening engine vibrations. The engine is cooled by thermostatically controlled liquid cooling, an auxiliary electric fan mounted behind the radiator cuts in at high temperatures (e.g. when stationary in traffic). Lubrication is by direct injection in to the inlet manifolds using Yamaha's 'Autolube' pump system, normally controlled in other two-stroke engines by throttle position the engine oil pump is controlled by the YPVS servo motor ensuring that the oil supply is not shut off at high engine revolutions. The RD500LC uses a six speed sequential close ratio gearbox, the gear shafts are removable from the right side of the engine without the need to split the crankcases. The clutch is of the wet, multiple-disc coil spring type and is cable operated. Unusually for a two stroke the gears are lubricated by a separate crankshaft driven troichoid oil pump. Final drive is by O-ring chain and sprockets. which featured adjustable anti-dive units. 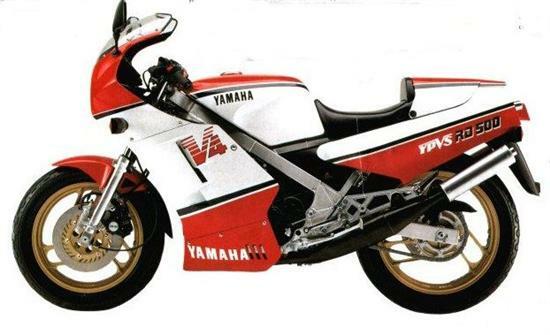 The RD500LC used twin ventilated disc brakes for the front wheel with a single ventilated disc at the rear. A solo seat cowl is provided to cover the pillion seat when not in use. The RD500LC features a standard 12 volt electrical system. Yamaha's self cancelling indicator unit is used and a variable resistance gauging system is used to monitor two-stroke oil tank contents with associated warning lights. Nippondenso Capacitor Discharge Ignition (CDI) is used in conjunction with two coils. The RZV500R was designed exclusively for the Japanese home market although many have been exported privately. The RZV500R features upgraded parts not found on the standard RD500LC. A major difference is the hand-welded aluminium frame, which is significantly lighter than the steel version used on standard models. The front brake lines are braided stainless steel instead of rubber coated, and the front forks are air assisted with rebound damping adjustment. The rear brake and gear levers are cast from aluminium, as are the clip-on type handle bars. These chassis modifications added up to a weight saving of 20 lb (9.1 kg). The engine was detuned to 64 hp (48 kW) to comply with Japanese legislation, this was achieved by restricting the internal diameter of the exhaust pipes. Although short lived in the UK enough RD500's were sold to make them a reasonably common site on the roads at that time. The RG 500 stole the thunder out of the RD as it was imported with an alloy frame and was a little faster and a slightly better bike. But the brakes wre still crap and the Suz anti dive was just as slopy as the RD , so it realy all came down to looks, and the RD500YPVS wins hands down there.